EA has released the Anthem launch trailer a fortnight ahead of the game's availability. Nowadays we are seeing multiple marketing teases; with pre-launch teasers, and some would claim even 'orchestrated leaks' ahead of the biggest product launches. So what should we expect on the actual launch date? A day-0 launch trailer, or similar perhaps. 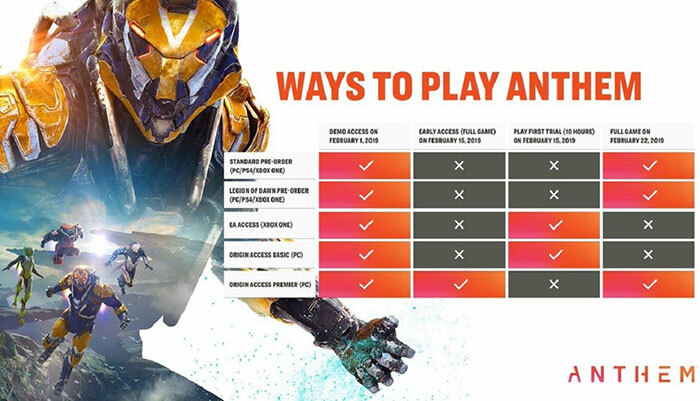 Furthermore, the Anthem demo, trial, early access, and full launch schedules are so tortuous to explain, only a graphical table can do the job succinctly (see below). Below you can find the Anthem launch trailer embedded. To recap one of our earlier reports on this game, this is a co-operative Action-RPG sci-fi game. In the video you will see some gameplay video highlights with frenetic combat scenes featuring our 'javelin' suited heroes. As a player you will be able to choose from one of four javelin suit specialisms to join with your friends and "take on a world full of danger". 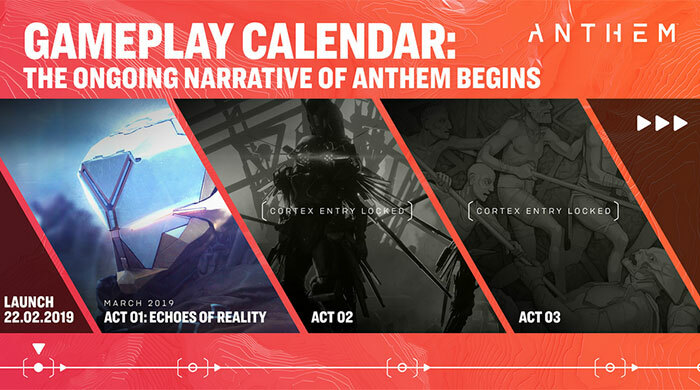 After the initial full launch of this new EA/Bioware title on 22nd Feb we will see Act 1: Echoes of Reality unfold, with Update 1: Evolving World, Update 2: Stronger Together, Update 3: The Cataclysm arrive ahead of Act 2 and Act 3 updates rollout later in the year. A week ago HEXUS reported upon the launch of EA/Respawn's Apex Legends on PC, Xbox One, PS4. The arrival of this free to play game came as an out of the blue surprise. However, even though its marketing contrasts heavily to the Anthem example above it has done extremely well for EA. In the comments of our launch story I noted that in 72 hours Apex Legends had chalked up 10 million players. Now an official update celebrates the statistic that "25 million people played Apex Legends during its first week". Furthermore, over the weekend the game saw "well over 2 million concurrent players," at its peak. In another EA news nugget, an official update to Battlefield V arrives today that delivers four-player co-op, as well as Nvidia DLSS support to the game. You can read the official patch notes PDF here, and this includes details not just of the new features but also of bug fixes and so on. So much as they're both Battle Royale games, yes it's like Fortnite. But Apex Legends is much better, and as word spreads through Fortnite's community I can see a lot of players switching. It's got much better mechanics, more tactical gameplay and it's super polished / runs well. 4.5Gb RAM when maxed on my system…impressively low. Looks great too.